Tender, Juicy, fall of the bone beef is what you’ll get with this Mexican Barbacoa recipe. Traditionally Barbacoa in Mexico is made with a cow’s head, cooked in a large fire pit in the ground. These days Barbacoa commonly refers to meat that is cooked low and slow to yield tender shredded pieces. We made this in a dutch oven on the Kamado Grill, but this recipe can easily be adapted to make in the crock pot. My cousin was in town visiting this weekend, so she got to experience an authentic Mexican meal complete with tacos, Mexican street corn, Guacamole, and pinto beans. Before shot of the Barbacoa cooked in a dutch oven on the grill, low and slow for 6 hours. If you are using a crock pot, low for 8 hours will work too. Be sure all the meat is covered in liquid to prevent over drying. The liquid will evaporate during cooking, but it’s OK. Once the Barbacoa is done, remove the meat and place in a large dish for shredding. If you are using beef shanks with bone, remove from bone and save the center bone marrow, my husband likes eating this. Otherwise you can use Chuck Roast meat instead. If there are juices left, add some back into the shredded meat. Serve as tacos with some Cotija cheese, cilantro, radishes and lime. This meat is perfect for Burrito Bowls, on top of a Salad, or for breakfast cooked with eggs. 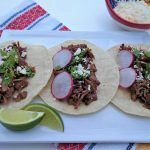 If you’re looking for an easier recipe using a Chuck Roast and a few pantry spices, then try my Mexican Shredded Beef. It can be made in an Instant Pot or slow cooker and tastes just as good! Tender, Juicy, and fall of the bone beef is what you'll get with this Barbacoa recipe. Season Beef with Salt and Pepper. This recipe used Center Cut Beef Shanks, but you can also substitute Chuck Roast. Place meat in bottom of Dutch Oven or in Crock Pot. Add remaining ingredients and be sure meat is covered in liquid. Cook in a dutch oven on the grill, low and slow for 6 hours. If you are using a crock pot, low for 8 hours will work too. The liquid will evaporate during cooking, but it's OK.
Once the Barbacoa is done, remove the meat and place a a large dish for shredding. If you are using beef shanks with bone, remove from bone and save the center bone marrow for eating. If there are juices left, add some back into the shredded meat. Serve as tacos with Cojita Cheese, Cilantro, Radishes, and Lime.